Huang, W. and Chen, R.F., 2009. Sources and transformations of chromophoric dissolved organic matter (CDOM) in the Neponset River Watershed. J. Geophys. Research-Biogeosciences, 114, doi: 10.1029/2009JG000976. 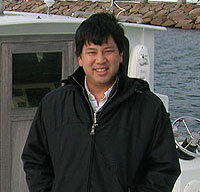 Chen, R.F., 2008. Ocean education and outreach for fame and fortune-A case study. Current-The Journal of Marine Education, 24: 36-40. Drouin, P, Welty, D.J., Repeta, D., Engle-Belknap, C.A., Cramer, C., Frashure, K., and Chen, R.F., 2006. Seeing the Carbon Cycle. Science Scope, January, 14-18. Chant, R.J., Glenn, S.M., Hunter, E., Kohut, J., Chen, R.F., Houghton, R.W., Bosch, J., and Schofield, O., 2007. Bulge formation of a buoyant river outflow. Journal of Geophysical Research 113. Chen, R.F. and Bada, J.L., 1992. The fluorescence of dissolved organic matter in seawater. Marine Chemistry, 37: 191-221. Gardner, G.B., Chen, R.F., and Berry, A., 2005. High-resolution measurements of chromophoric dissolved organic matter (CDOM) fluorescence in the Neponset River Estuary, Boston Harbor, MA. Marine Chemistry, 96: 137-154. Chen, R.F. and Gardner, G.B., 2004. High resolution measurements of CDOM in the Mississippi and Atchafalaya River plume regions. Mar. Chem., 89: 103-125. Callahan, J., Dai, M., Chen, R.F., Li, X., Lu, Z., and Huang, W., 2004. Dissolved organic matter in the Pearl River Estuary, China. Marine Chemistry, 89: 211-224. Vlahos, P., Chen, R.F., and Repeta, D.J., 2002. Fluxes of dissolved organic carbon (DOC) in the Mid-Atlantic Bight. Deep-Sea Research II, 49: 4369-4385. Aluwihare, L.I., Repeta, D.J., and Chen, R.F., 1997. A major biopolymeric component to dissolved organic carbon in seawater. Nature, 387: 166-169.